Traveling can be tiring on anyone. It doesn’t matter if you are traveling by land, sea, or air, something about sitting still for a long period of time can be both mentally and physically draining. But while all of that tedium, discomfort, and boredom is almost always worth it for a great experience in a new location, try explaining that opportunity to a pre-schooler. While an adult may be satisfied to wait out a less-than-luxurious ride with a book or a smartphone, young children need more mental stimulus than that. 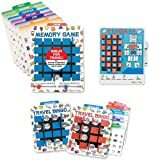 So if you are planning to travel with some youngsters and are trying to avoid a hissy fit or an endless stream of “are we there yet?”s, invest in a few of the travel games listed below. Your little one will stay entertained and you will stay sane! Plane travel is public, so it is especially important to keep your young children calm and entertained for the sake of your fellow passengers. It is also important to keep your children entertained with small, easy to pack and store games for the sake of your own sanity! No one wants to wind up on their hands and knees in a narrow flight row fishing for small game pieces that kids will inevitably lose track of. For those reasons, the games and activities listed below are small, easy to pack, and feature connected play pieces! Not a lot of people realize this, but paper is actually incredibly heavy and hard to travel with. If your child is an artist, you can keep them happy without having to lug around heavy drawing materials by offering them this dry-erase folder. The easy velcro-closed folio opens up to reveal two dry-erase canvases, elastic rings for four markers, and an EZ erase cloth. Your kids can draw and play for hours. When space fills up, they can simply erase it and start over! The markers and erase cloth are separate pieces, but they all come with their own holders and can be closed within the folder. They shouldn’t be difficult to keep track of. When your plane lands, you can slip this little folder in right next to your laptop. This is not the classic memory game that we may remember as a deck of cards. This is the travel-friendly version! The game consists of a play board with 25 little wooden “doors”. The doors can be lifted to reveal a picture underneath. Children will be tasked with flipping open doors until they find two matching images. Once they have found everything on the board, you can slip a new play card from behind the little doors, and the challenge begins again! With this game, you don’t have to worry about losing playing cards or small game pieces. Your child can hold it comfortably on their own lap, and you don’t have to worry about turbulence ruining their fun. If your child enjoys puzzles or games that involve critical thinking, then this is a fantastic choice for your family. This game is great for a parent and child to play together. Each card has a different Disney scene, and the player is asked to locate and identify an object within the picture. It is a deck of cards, which is risky to hand over to a child to manage. However, if the parent holds the deck and plays with their child, then this becomes not only entertainment but valuable bonding time as well! Car travel, unlike plane travel, is more private and spacious. This gives your children a little more space to spread out and engage with games that have more pieces. That being said, we have all lost things under car seats and in between seats and consoles, so we still do not want toys that are too complicated. The following items are engaging, easy to pack, and pretty stress-free when it comes to small pieces. This game consists of a magnetic folder with attached magnetic pieces. This way you can play tic-tac-toe over and over, without going through sheets of paper or worrying about your reusable pieces flying all over the car every time you change lanes or comes to a stop. 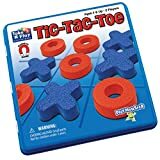 The game comes with two boards, one for traditional tic-tac-toe, and one for a more complicated toss-tac-toe that includes dice. The more complicated game ensures that this game will age with your children, keeping them entertained for years to come. This is another magnetic game that ensures your pieces will not go flying all over the car. 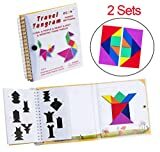 The magnetic board unfolds to over a foot wide, and it comes with colorful geometric magnets and a small book of designs for your young one to copy. Of course – if they just want to play with the colorful pieces, that is fine too! This is a great activity for a child to work on alone, or collaboratively with a parent or sibling. This art activity ensures that your child will not only be entertained while you drive but will arrive at your final destination with some beautiful designs! The Spirograph playset all packs into a travel-friendly plastic container, which contains a 24-page design pad, 6 spirograph wheels, and 2 pens. To use, your child just has to place the wheel on the track, load the pad behind the track, and spiral the wheel around the track with a pen. What comes out will surely surprise you! The next time you are facing hours of travel with a small child, make sure you have a few of these in your bag for your little one to enjoy!